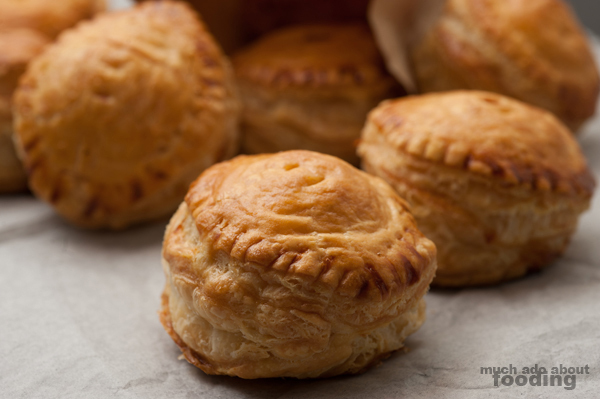 I didn't know what pâté chaud (bánh patê sô) was called when I was growing up; I always just called it the "hat pie" because the ones my mom purchased looked like little hats. There was the mound which is where the fatty meatball resided and then the flared outer crust. I liked the taste of it but never ate too many because they were unwavering in their greasiness. 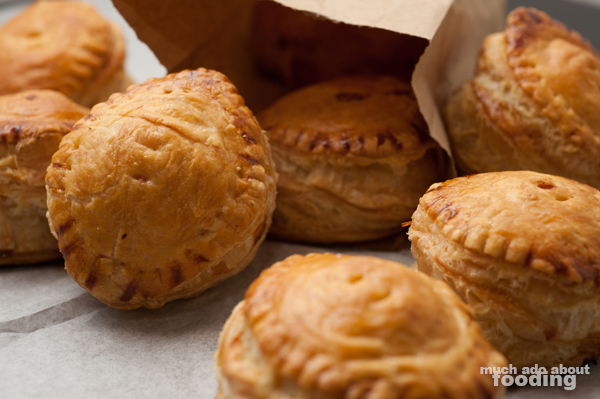 These Vietnamese snacks can be found in plenty of the bakeries and banh mi shops as flaky pastries full of savory meat. Once I finally learned the real name for them, I decided that I'd have to make some one day. 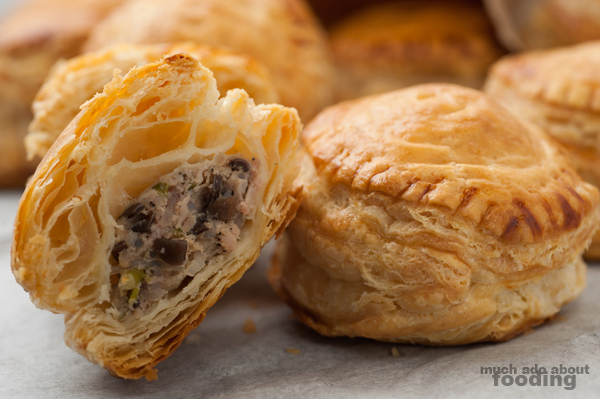 It appeared difficult until I learned what working with puff pastry was like - easy! Bánh patê sô just so happens to also be one of Duc's favorite things to eat growing up (and even now!) so he was very much encouraging me to venture in this direction. From memory of what the filling was like, I put together my own interpretation of the snack and though they don't look like hats, they sure are tasty! 30 square sheets puff pastry, 5" x 5"
Two of the ingredients need to be soaked into a softer, workable texture prior to including them in anything. Submerge your wood ear fungus in water after one rinse. Submerge dried vermicelli in warm water. Let both sit as you prep other ingredients. In a large mixing bowl, combine ground pork, pate, peppers, salt, one egg, fish sauce, and chopped chives. Sweat the chopped onions in a saucepan until translucent. 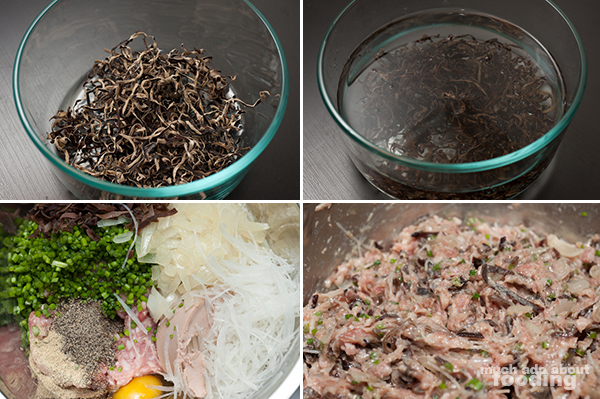 Add that, chopped up fungus, and vermicelli to the bowl to mix. 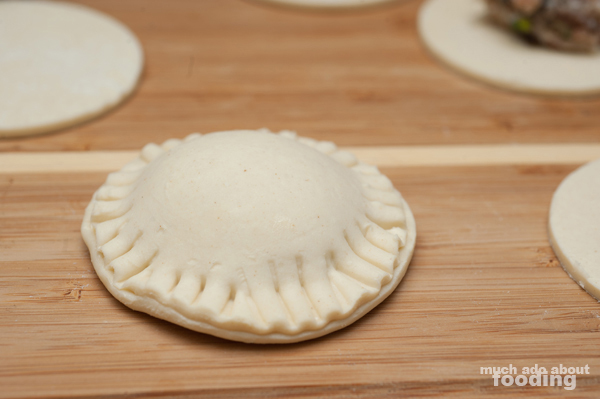 For pastry sheets, cut out circles of 2.75" size (if following my exact sizing). 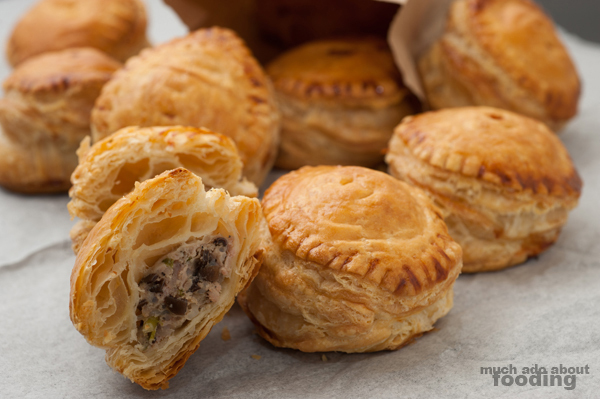 The puff pastry circles should be sliced out right when the pastry gets slightly softer from defrosting. 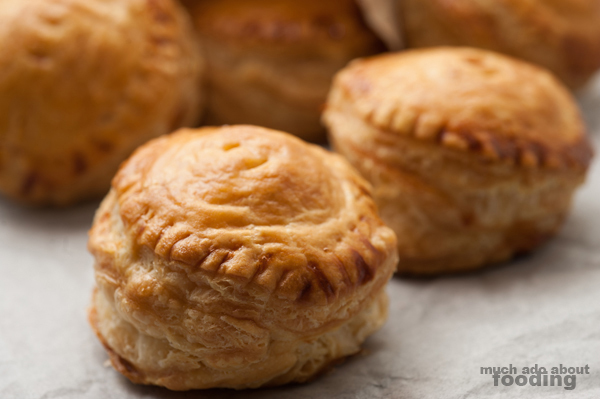 You'll want to work with cold puff pastry that hasn't been handled too much in order to maintain the fluffiness once it has baked (the shortening/butter inside needs to remain cold to expand during baking). Heap 1 Tbsp or more of meat mixture into the center of a circle. Beat remaining egg in a small bowl with some water - rub this along the edges of the dough to help create a seal. 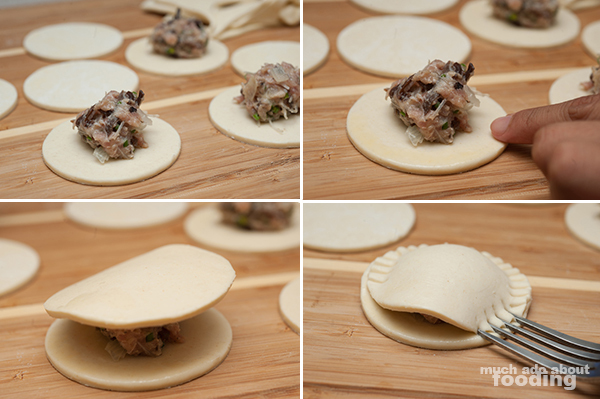 Lay another circle on top of the meat and gently press down the border with a fork until they are sealed through. Preheat oven to 350°F. 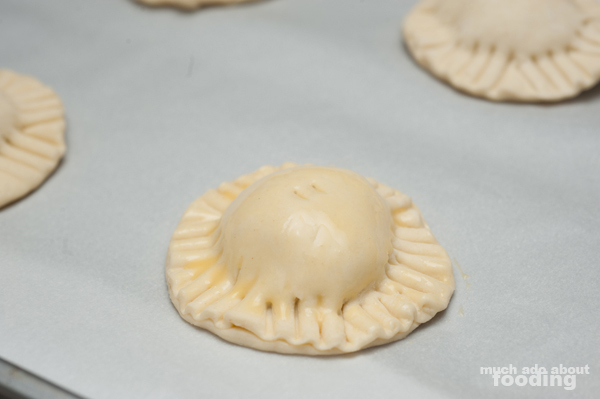 As aforementioned, colder dough leads to better pastry so make sure you keep your finished ones cool. Do not handle the dough too much (though you will later). You may want to put some in the freezer if they start to soften too much. 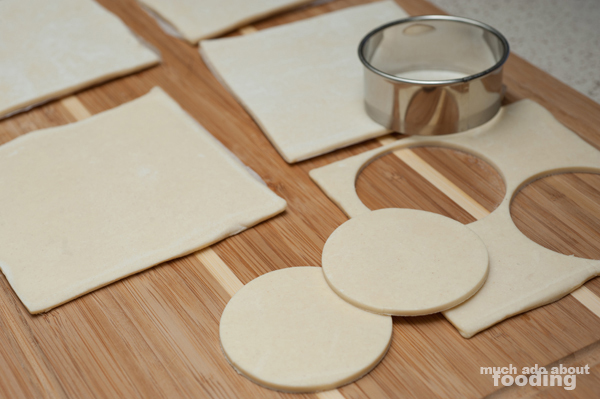 For excess pieces of puff pastry during your circle cutouts, combine together and roll out to make more "sheets." Continue until you're out of dough! 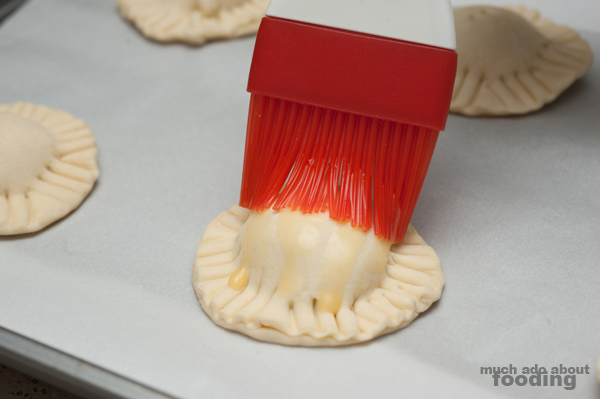 For completed pastries, set on a lined baking sheet and brush egg wash on top. Make two small slits at the tip to allow for steam to release. The egg wash will give the bánh patê sô a golden brown after you've baked it for 30-35 minutes. Remove and let cool slightly before serving. I know you'll enjoy these as well as sharing them with everyone! I've eaten variations depending on where I bought them from and have always found the ones with these extra ingredients the tastiest :)! What were the ones you had like, Nita?